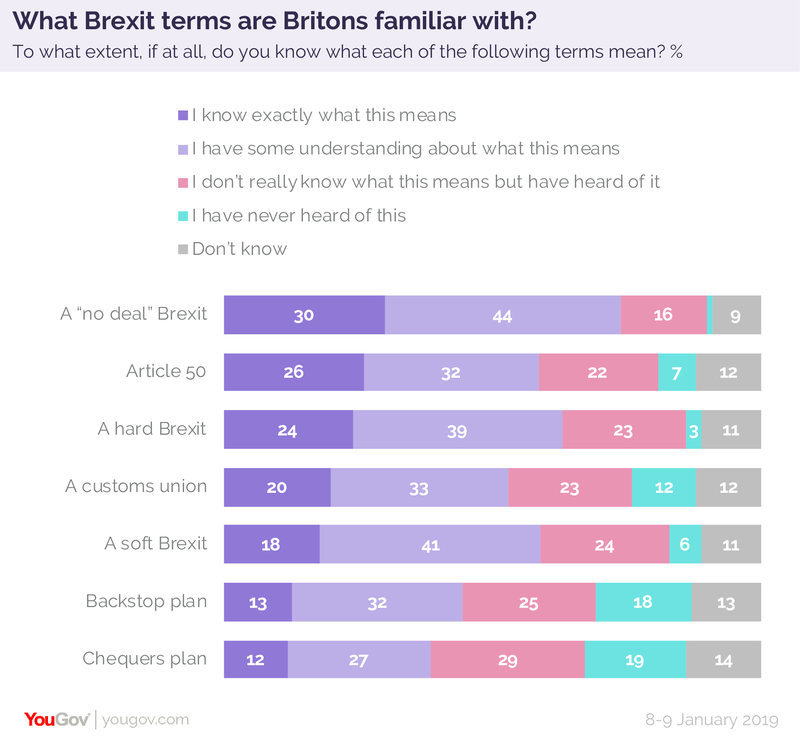 January 11, 2019, 11:19 a.m.
With just two and a half months until Britain is set to leave the EU, YouGov research reveals that the British public are still unsure what some of the common jargon surrounding Brexit actually means. 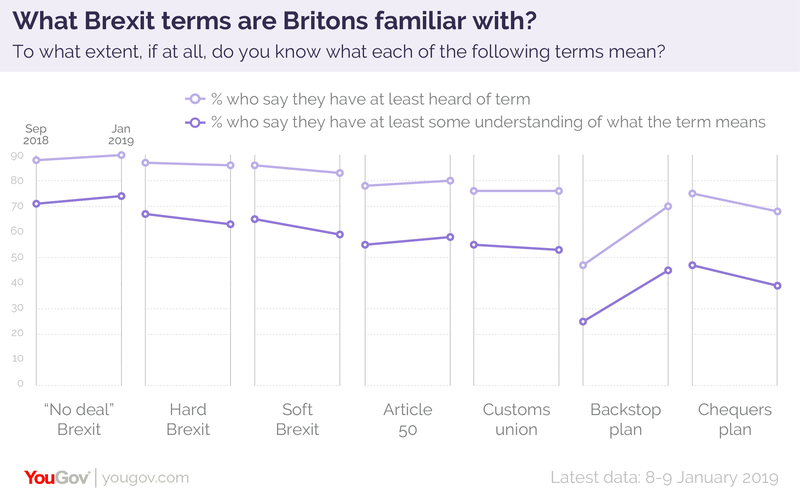 Back in September we asked people if they understood a number of terms including “Chequers plan”, “backstop”, “Article 50” and “customs union” to see how many actually cut through. Ahead of the crucial Commons vote next week we’ve revisited the issue to see what’s changed following months of news coverage and political debate. Knowledge of the “backstop” has increased over the last four months, with 45% of Brits now having at least some understanding of the term, compared to just 25% back in September. But only 13% of British adults claim to know exactly what it means. Another one in five (18%) have never heard of it at all, which is significantly less than the 40% who were in this position in September. There’s also more understanding of what a “no deal Brexit” is now, with 74% of the public saying they have some understanding of it. Meanwhile, 58% say the same about “Article 50” and 53% about “customs union”. Again, there is a large drop off when we get into specifics. Only 3 in 10 Brits know exactly what a “no deal Brexit” involves, even though it’s a commonly used phrase heard of by 90% of the population. 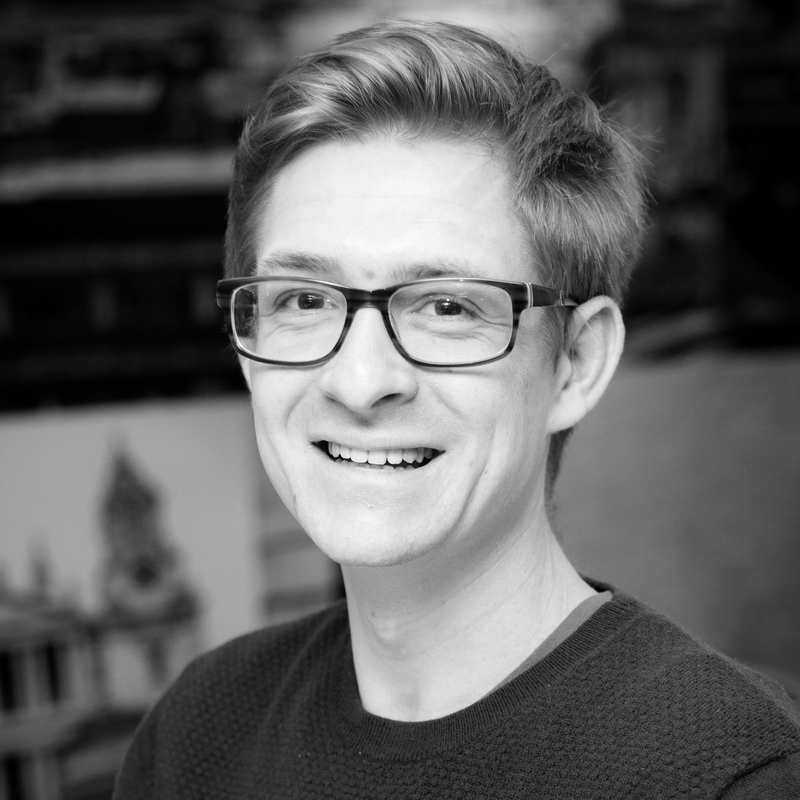 Knowledge surrounding the terms “hard” and “soft Brexit” has remained largely static over time. The vast majority of the public had heard the terms used, both now and back in the Autumn - currently 59% of Brits say they have some understanding of "hard Brexit" and 63% say the same for "soft Brexit". The “Chequers plan”, a white paper written in July that detailed a strategy for a future UK-EU relationship, has seen the biggest drop in public understanding. It’s rarely mentioned in the media now, having now progressed to “May’s deal”. Only 39% say they have some understanding of the “Chequers plan”, a fall from 47% in September. There’s very little difference between Leave and Remain voters in how well they understand Brexit jargon. There is, however, a notable difference in knowledge between age groups. Less than a third of those under 25 understand what the “backstop” plan is, compared to 54% of those over 65. Younger respondents are also far less likely to have heard of these terms. Only 42% of those aged between 18 and 24 have heard of the term “backstop”, 51% have heard of a “customs union” and 64% recognise the term “Article 50”.